With the population doubling over the last 20 years, the City of Bedford was in dire need of new aquatic recreation for its citizens. In 2002, the city retained the team of Counsilman-Hunsaker, and Kimley-Horn & Associates, to conduct a Feasibility Study, offering the city the knowledge to move forward with the design of this spectacular aquatic center. The concept was to create a compact, highly themed municipal family aquatic center with aquatic and play features for tots, families, and teens. Bright colors, a tropical theme and signage were used to create a fun and attractive environment. 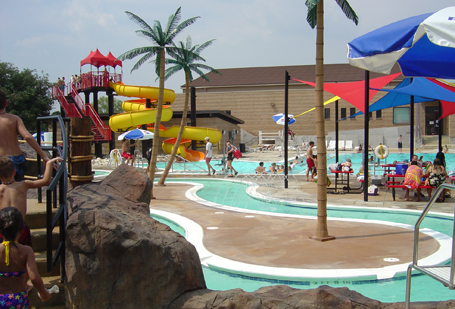 The Bedford Splash at Boys Ranch is the town’s largest park. Designed around a tropical beach theme, the park consists of three separate bodies of water appealing to all ages. The 5,850 sq. ft. leisure pool known as “Splash Beach” has an interactive play structure, raindrop waterfall, current channel, lily pad walk, two slides, and tipping coconut palm trees. “Snorkel Bay”, which is a 4,584 sq. ft. 25-yard lap pool at four feet deep, features a small slide with a slide-landing zone, and the “Turbo Twister” bowl waterslide. The third aquatic component is a 490 sq. ft. tot pool known as “Guppy Cove” with a Tiki boat slide and a sea turtle named Lil’ Squirt.